Our Contributing Writers continue to provide some of the most useful—and popular—posts on the blog, and I know you appreciate them as much as I do. Now I’m adding another asset to this stellar group of writers. 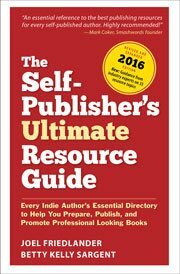 David Kudler is a friend, colleague, and an expert provider of publishing services and a consultant to independent and self-publishers. An author himself, he lives just north of the Golden Gate Bridge with his wife, Maura Vaughn, daughters, and their cat. David is the founder of Stillpoint Digital Press. Since 1999, he has overseen the publications program of the Joseph Campbell Foundation, for which he has edited three posthumous volumes of Campbell’s previously unpublished work and managed the publication of over fifty print, ebook, audio, and video titles. He blogs for the Huffington Post and he’s also a past president of the Bay Area Independent Publisher’s Association (BAIPA). A published author, he is currently working on a young-adult historical adventure novel set in sixteenth century Japan. I can’t wait to see what David has in store for readers, especially in the field of ebooks. And we won’t have to wait long, because his first post will go live tomorrow. Stay tuned and help me welcome David to The Book Designer.